Intelligence is more than a capability you’re born with, it also accumulates with experience, which is how the word is used in military and governmental parlance. One “gathers intelligence” about a subject through inquiry and study. Rather than applying all that I have learned to, say… better my financial standing in the world, I have largely wasted my meager gifts on finding good, cheap wines. Since humans learn from their mistakes, and remarkably intelligent humans learn from other’s mistakes, you can be smarter and more wise than me by taking my intel gathered at not-so great cost and use it to your advantage, while focusing your brain on your retirement funds. That way you can drink well once you’re rich. I first learned of the magic of Europe’s amazing 2001 vintage about a decade ago. I heard about some “recently released” 2001s around 2008 that seemed to turn the vintage’s early, disappointing reviews around. From that information I was able to find what I believe is the best, cheap wine I have ever tasted, a 2001 Viña Olabarri Rioja. I managed to snap up a case and a half of this amazing wine before it vanished into every smart persons cellar around 2013. I also picked up a few 2001 Burgundy and Bordeaux bargains from premier cru producers along the way. To this day, I still troll online retailers for 2001s from Spain & France. A few months ago this one popped up: 2001 Chateaux Thieuley Reserve Courselle. 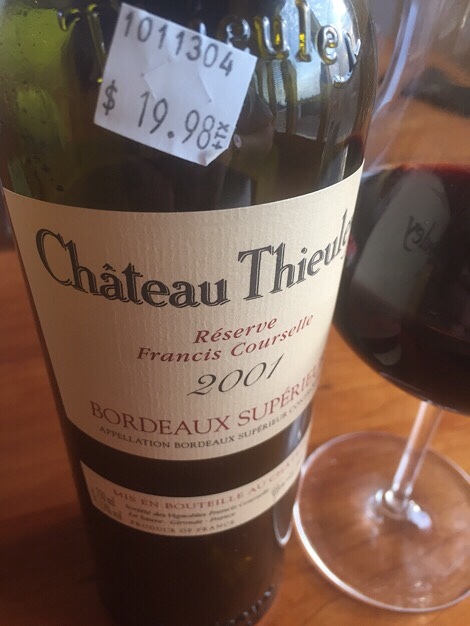 It isn’t a 1er Cru, but a “Bordeaux Superieur”. No matter, because at under twenty bucks it is delightful. Plenty of that funky forest floor & barnyard nose you expect from a French wine when you open it. Nice depth of color in the glass. Wonderful leatherish flavor. I drank this one over two nights and it never lost a step along the way. If anything it got better. Grab a few bottles. You can thank me later by flipping me a few bucks when I’m living in a cardboard box.